"You see!" said a strained voice. Tonks was glaring at Lupin. "She still wants to marry him, even though he's been bitten! She doesn't care!" "It's different," said Lupin, barely moving his lips and looking suddenly tense. "Bill will not be a full werewolf. The cases are completely--"
"But I don't care either, I don't care!" said Tonks, seizing the front of Lupin's robes and shaking them. "I've told you a million times..."
And the meaning of Tonks's Patronus and her mouse-colored hair, and the reason she had come running to find Dumbledore when she had heard a rumor someone had been attacked by Greyback, all suddenly became clear to Harry; it had not been Sirius that Tonks had fallen in love with after all. "And I've told you a million times," said Lupin, refusing to meet her eyes, staring at the floor, "that I am too old for you, too poor... too dangerous..."
"I've said all along you're taking a ridiculous line on this, Remus," said Mrs. Weasley over Fleur's shoulder as she patted her on the back. "I am not being ridiculous," said Lupin steadily. "Tonks deserves somebody young and whole." "But she wants you," said Mr. Weasley, with a small smile. "And after all, Remus, young and whole men do not necessarily remain so." I blame this entirely on the HBP audio book for reminding me of scenes that were cut from the film. I tried to kind of movie-ize the characters a bit, but obviously wasn't going for dead-on likenesses. Anyway, just another quick sketch I added gray tones to. Remus and Tonks FTW! Apparently JKR approved all the changes that were made from the books to the movies, so I ask myself, What on Earth was she thinking? Because so many good scenes got cut out! One of many scenes that made my heart hurt. Thanks for bringing it to life. this is my fav couple.why did they have to die!!!!!!!! !when i read that they died i imagined them lying next to each other holding hands. God! I told you something.... today I finish to read Harry Potter and The Half-Blood Prince, and when I came to this part of the book, the first i thought was "I sure somebody has made a picture or a fanart about this moment.."
how on earth did harry think that tonks loved sirius?!? THEY'RE COUSINS IDIOT! How old is Tonk's compared to Lupin ? Finally, a picture of "cute goth girl" Tonks! I was really tired of blue-haired Tonks pics. I just finished reading this part! I love your interpretation of the scene. I Looooveee it!! It's AMAZING FOREVER!! It's my new Wallpaper! So amazing. Its captured so brilliantly. Well done! Keep it up. I pictured it exactly like that! It'sbeautiful. i like harry -but he look like james with out the scar- which is kindda scarry dont u think? Really amazing drawing, captured the moment perfectly! I love it! Its just as I pictured it in the book! Really amazing job! I love Tonk's hair and Lupi- oh he looks cut up- is really awesome! This is so amazing I almost peed myself. Lol jk jk... But this is real good. oh remus! love his body language and facial expression! I forgot all about that part of the book. Thank you for this wonderful piece of artwork, and for making me tear up. yaaay! Tonks and Lupin, i was so annoyed this wasnt in the movie!!! and Harry at the back is like: WTF is going on here!?!?!?!?!?! You've portrayed this scene perfectly! Well done! GO TONKS!!!! amazing Remus's expression is perfect. This is completely and utterly mindblowing-ly good! I was so mad when they cut all Tonks/Lupin out of the movie, except for that one scene NOT EVEN IN THE BOOK... where Tonks had 3 lines. most just one word. I love this ship and wanted more. they had better include more in the Deathly Hallows... But LOVE THIS!!! 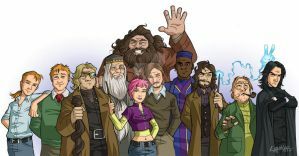 Tonks and Lupin are best and everything important is missing! And yeah, it is sad we didn't get to see it onscreen. Hopefully they'll get more screentime in the DH films. yes, I hope so me too!